Have you seen the Tree Change Dolls that Sonia Singh creates from discarded Bratz dolls? If not, watch this video she has posted about how she got started. Her story inspired me to create some dollies for me and my two sisters for Christmas. Even though we are adults, I think you never out grow loving dolls. While I did not use Bratz dolls, I found these cute Sparkle Girlz dolls and decided to make them several outfits and accessories to go along with them. 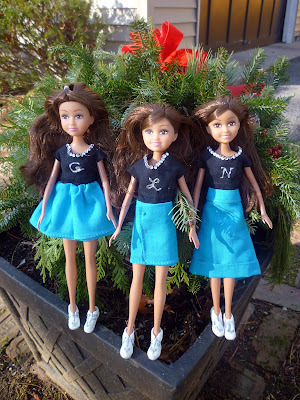 Then, as Sonia does, they also had a photo shoot outside before they were shipped out. 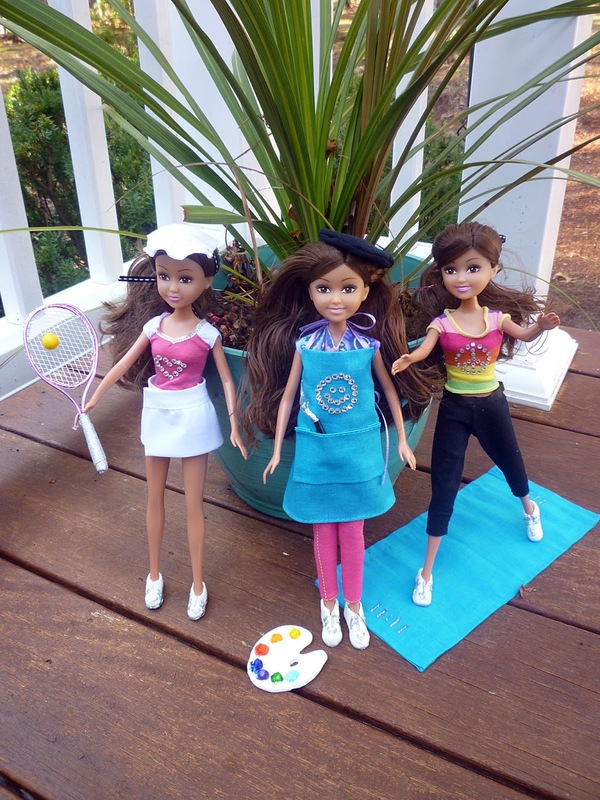 The artist in the middle of this picture is my doll. Her name is Nina. She is an artist, and yes that is a palette knife in her pocket. 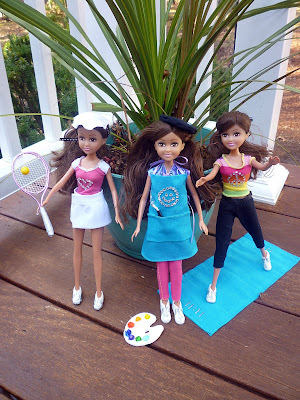 My sisters dolls are Gina (the tennis player) and Luna (the yoga master). I discovered during this experience that I am a terrible seamstress, so anything that I could glue or stick on instead was much preferred. I used a lot of velcro as fasteners. Here is a photo of my work table during production. I molded them each a pair of sneakers using Crayola's model magic. So much fun. 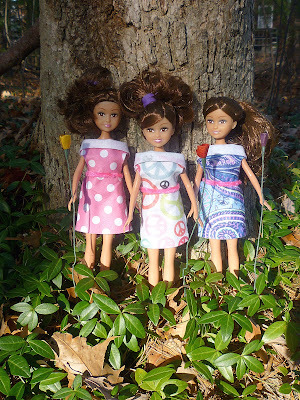 My sisters and I all live far away from one another so I am looking forward to the next time we meet up as our dolls will travel along with us and most likely have another photo shoot together. I found 3 of these matching wine bottle boxes that were the perfect size for transporting them and their outfits. If you ever try this yourself you will see how addictive it can be.